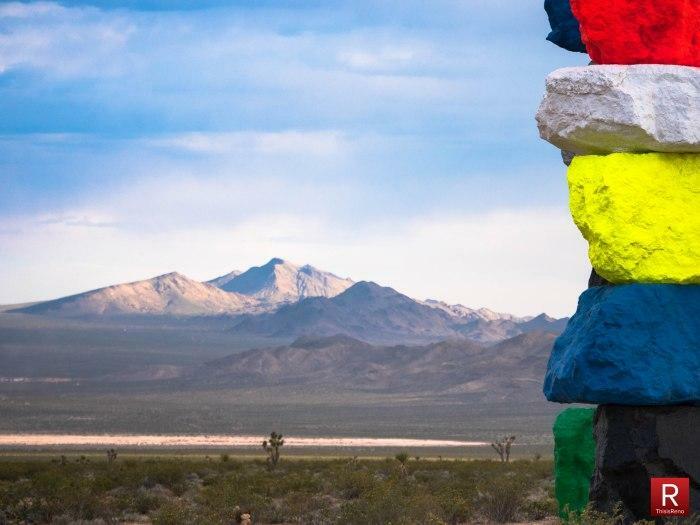 Despite some recent vandalism, a new public land sculpture installed by the Nevada Museum of Art and several partners is quickly becoming a roadside attraction outside Las Vegas. Our contributor Bob Conrad of ThisisReno made a trip down south to check it out. Yamile Lo Dico and her boys are checking out the exhibit on a scorching evening near Jean, Nevada. These last minutes of daylight are highlighting several giant colored boulders. 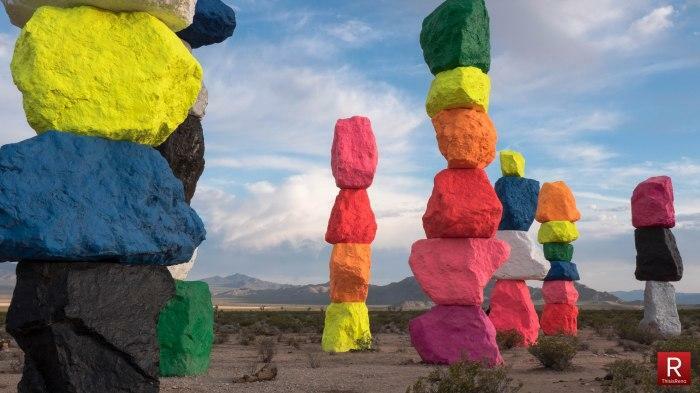 They're called the Seven Magic Mountains, and they're stacks of towered boulders painted fluorescent colors about 10 miles south of Las Vegas. 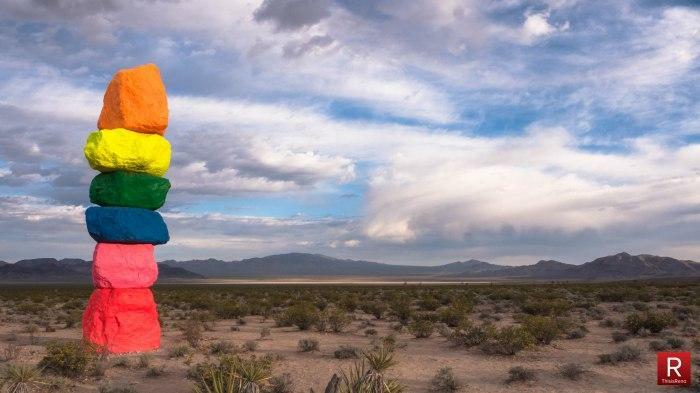 "It's something different to see, some color in this desert," Lo Dico says. "Last week a friend of mine came and said it was really nice and something different to do besides the strip." For many who visit the site, the towers are selfie magnets. 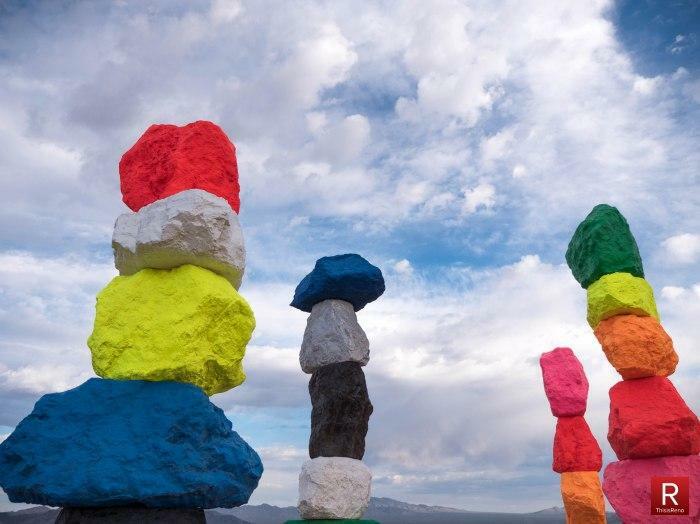 They're more than 30 feet high, and you can see them from Interstate 15. 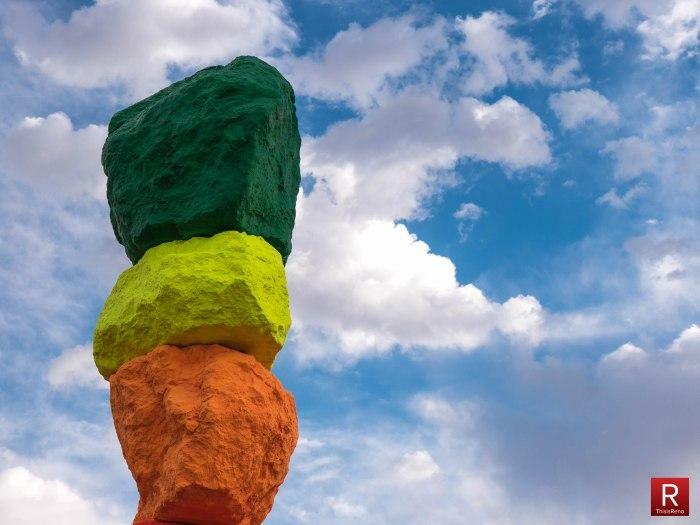 Amanda Horn of the Nevada Museum of Art says the sculpture builds upon previous land art that appeared in the area historically, including petroglyphs. 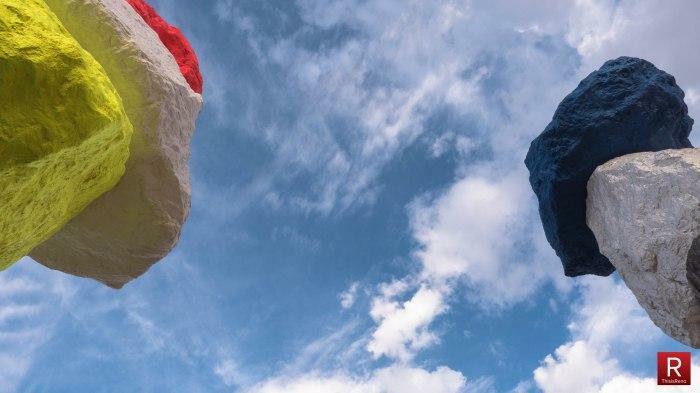 The creator is Ugo Rondinone. 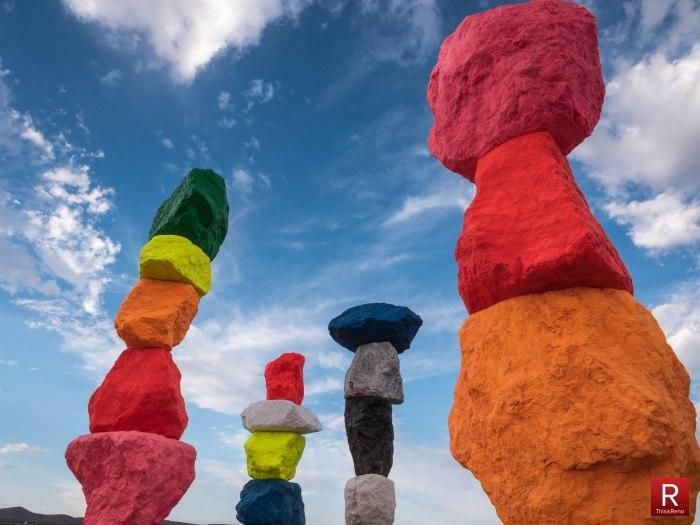 His work is recognized for blending the natural and artificial, which is why he placed the multi-colored boulders by both the nearby interstate and a dry lake bed. We recently covered Directions 2016, an economics conference in Reno. Unlike in the past, this year’s conference included what's called a cultural forecast. 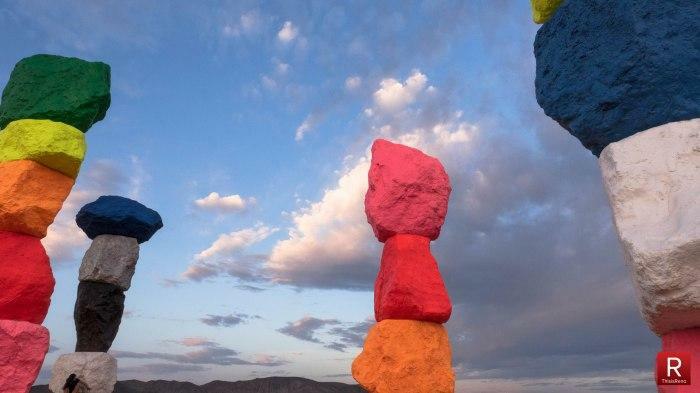 While other speakers focused on economic trends, Colin Robertson, curator of education for the Nevada Museum of Art, looked closely at the impact art could have on Nevada’s economy. To learn more, our reporter Rocio Hernandez sat down with him. 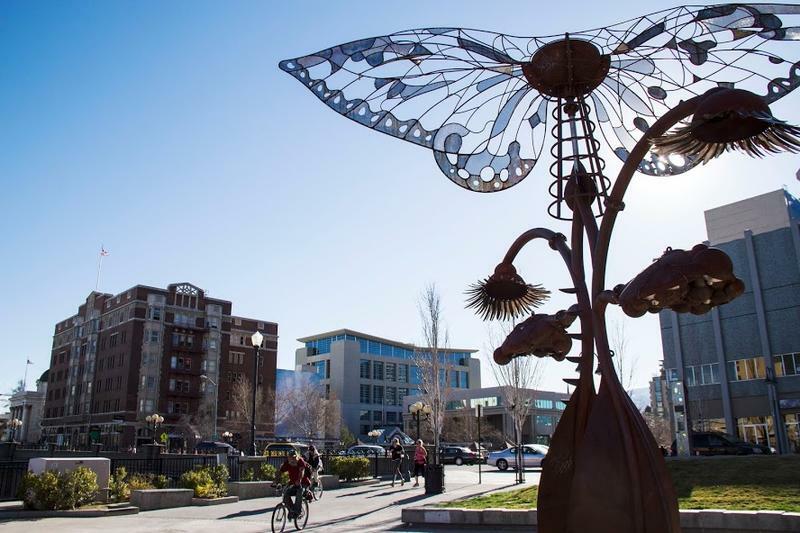 Reno City Council has designated a new space for public art. Downtown’s Art Plaza, formerly known as City Plaza, will permanently house several works, including the popular “Believe” sculpture created by Jeff Schomberg. A traveling exhibit of Basque Art opens in Reno next week. It features elaborate carvings by local sheepherders who used Aspen trees as their canvases decades ago. Reno Public Radio’s Steve Shadley introduces us to a married couple that’s been collecting these unique carvings for nearly 50 years.